The famous words, that will go down in history as golden words from Mr. Ratan Tata. Ending all speculation the Rs.1 Lakh car was launched at Delhi Auto Expo. It meets Euro 4 emission norms, runs 20 Km in a litre, has passed front and side crash tests.But where will all these additional cars go? The streets of every Indian city are already at gridlock with the rickshaws, marutis, santro and goods vehicles. India needs to upgrade its infrastructure, and enforce some sort of highway code, before unleashing millions of new vehicles onto its roads. Will this more fuel efficient car replace many existing cars on the road? Will it kill the second hand market for other makes and make them so cheap that more two wheeler owners will buy cars now? Should’nt we be penalising larger cars and SUVs (maybe with higher taxes) rather than blaming the Tatas? Will this take off in the rural areas? Tatas are talking about exporting this in the future. What will it do worldwide? The only answer I know is to where will these additional cars go? Nowhere, they will add to the gridlock in many cities. I find the whole price issue interesting, though, as the reality is that is has never been “cheaper” to own a car in India than today. Most of the new cars on the road in India weren’t paid for in cash but are financed. Many of the car loans available today are terribly easy to get sucked into, with little to no money down, and pushy car dealers eager to earn bank commissions. In this atmosphere, what will be the role of the “1 lakh” car? Will it enable families who can afford the price tag to finally get their first four-wheeler, or will it plunge even poorer families into the murky world of debt otherwise known as car finance? The issue has no straight-forward answer, but the other factor that has led to the massive increase in vehicles on the roads in India is the artificially low price of fuel due to gov’t regulation in the country. There are populist reasons for keeping the price of fuel low, but the economic and environmental reprocussions are unavoidable. By the way, since the production lines that Maruti is using for 800 are more than couple of decades old, and taking into account the depreciation and sheer production numbers, each car costs only Rs.97,000 to the company. 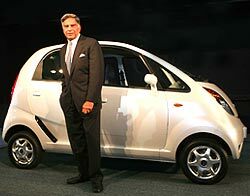 Ratan Tata may end up being the Henry Ford of our generation. However, the fatal flaw in the car is obvious. Any average indian pothole will bring this car, with its SMALL WHEELS, to a grinding halt! 6 Responses to "Nano – Tata’s promise fulfilled"
The “people’s car” is a wonderful example of India’s mid-20st Century mindset and its squandered chance at 21st Century development. My short essay on this, India Going Nowhere Fast, can be read at http://memestreamblog.wordpress.com/2007/10/12/india-going-nowhere-fast/. yes, every one’s raising the question- whr will all these cars on road lead us to? I think tata’s have done their work in providing what masses need. we should not blame them. what they hav done is splendid. it is govt who needs to decide on infrastructure & environment. india doen;t need lotsa cars/2 wheelers on the road. we need efficient public transport system. motor cycles. Tata name stands for quality and Nano can save a lot of lives. clogged roadways, wasted time, and road rage.